Rescue workers in Nicaragua are trying to reach at least 24 workers trapped by a cave-in at a gold mine in a remote region in the north of the country. Local officials said two miners had managed to dig themselves out after a mine shaft collapsed due to heavy rain. Earlier, emergency workers said they had heard voices of the trapped miners. The mine's former operator said the cave-in happened on Thursday morning near Bonanza, a town 420km (260 miles) northeast of the capital Managua. Rescuers using dogs located 20 of the 24 miners about 50 metres (165ft) below the surface on Friday but said they had been unable to free them. 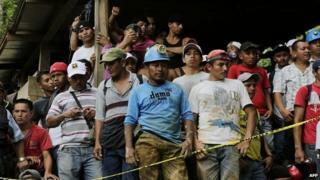 Milagros Solorzano, a local politician, said the group were currently in a cave inside the mine and have been able to communicate with rescuers. The group said they did not know where the four other miners were. "Twenty of them are in a safe place and have asked for food and water," government spokesman Rosario Murillo told local media. Hemco, the Nicaraguan subsidiary of Colombian miner Mineros SA, said it had condemned the area where the miners are trapped after inspectors recently found it to be unsafe. It said the miners who are trapped are freelancers who had continued to work there despite the company's warnings after two miners died last month in a landslide caused by heavy rain. A company spokesman said that although the freelancers were not employed by Hemco, they were allowed to operate in areas controlled by them if they agreed to sell any gold they find to the firm. The freelance form of mining is legal in Nicaragua, the poorest country in Latin America, to enable more people to profit from the industry.